If it's the end / beginning of the month in the GTD office then that means it's financial accounting time. Although I have accounting tasks every week of the month, it's during the last week & the first week of each month that I spend a concentrated amount of time entering monthly statements, paying the upcoming month's bills, sending out invoices, setting up payroll checks, paying payroll taxes, archiving receipts, creating financial status reports, making deposits, sending out contratcs & occassionally having to track down people who haven't paid what they owe us. With the exception of having to sometimes be a collections agency, I LOVE the accounting part of running an organization. It's very time consuming, but praise God that my spiritual gift is administration so like any other admin geek I can't wait to organize everything, including our ministry finances!! Like most non-profits we aren't in this for the money (Oh, I've got tons of proof I can show you to validate this point - LOL!! ), but as an organization & a business if you neglect or minimize the importance of finanial stability & financial order then your organization will quickly cease to exist. Finances to a Christian ministry is much like oxygen is to the body. Your body doesn't live to breathe; it breathes to live. My body doesn't focus on breathing; it focuses on living. Breathing helps fuel the living. 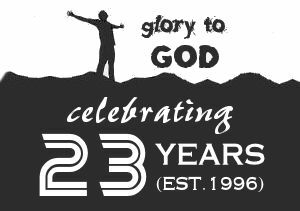 As a ministry we focus on glorifying God through our Programs, the finances help support the focus. If we "hold our breath" as a ministry and deny the importance of God's establishment of an economy then we will soon suffer hypoxia (lack of oxygen) then become sluggish followed by unconsciouness followed by death. We weren't designed to serve both God & money (Matt 6:24). We were designed to serve God and wisely manage our resources & finances (Matt 25:14-30). It's the end of the month which means it's time to assess our "breathing" and "oxygen levels" so we can get back to the business of living... fully living in & for Jesus Christ that is. 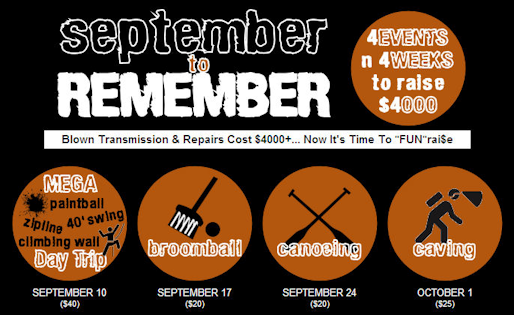 The idea behind September to Remember (S2R) is more than just 4 awesome activities. It's also about unveiling all the NEW things that God is in the midst of doing in and through this ministry. We want to share our excitment with you. 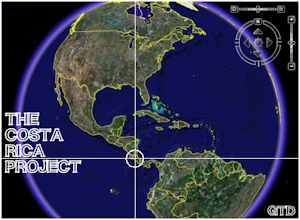 And we want you to be a part of what's going on in GTD. Over the past 4 years we have been bogged down with surviving the national economic mess along with transitioning from 5 fulltime employees & 20+ volunteers to only 2 fulltime employees and a few volunteers (with the same amount of work load). It's been a MONSTER of a task, but we have stayed the course. 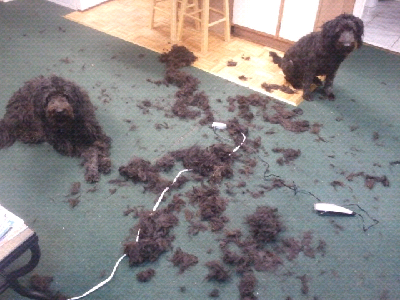 We have persevered. And now we are only a few hurdles & hopefully one last financial crisis away from entering the Promise Land!! 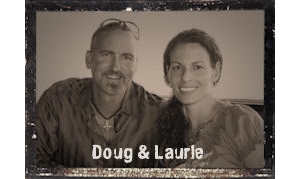 For the first time in years I (Doug) have time to pour into new developments, needed improvements, and vision casting. For the first time in years we are getting ahead of "the game". 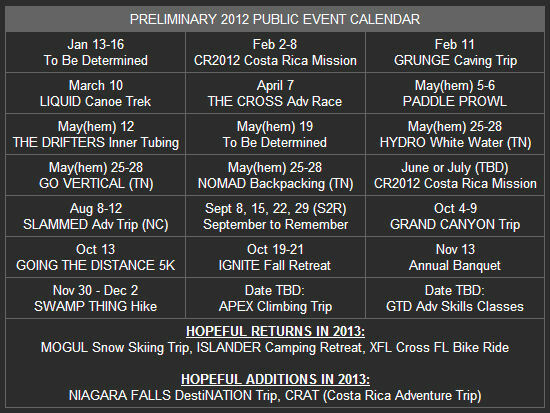 The 2012 Public Event Calendar is basically done and we are believing God for the 2012 PRIVATE Event Calendar to be completed by the end of October!! THAT's HUGE!! It's unprecedented in GTD!! You know that feeling that you get when you can see the light at the end of the tunnel... when you exert yourself so much to get to the finish line that your body wants to collapse... then you turn the corner and you can see the finish line. Your whole body becomes rejuvenated. Your very soul is revived. And you break out in chills as you realize, "I'm going to make it. I'm going to make it!! I'M GOING TO MAKE IT!!" That's what I'm experiencing right now. We still have some hurdles to clear and a crisis to overcome, but I can see the finish line right around the corner. Thank you for your continuous prayers & support of GTD as we fight back to strong & stable health. All this month I'm pleased to share with you many things that we are working on. We are excited about all that God is doing right now in GTD. MANY UPDATES COMING!!! GTD On CTN TV Again! 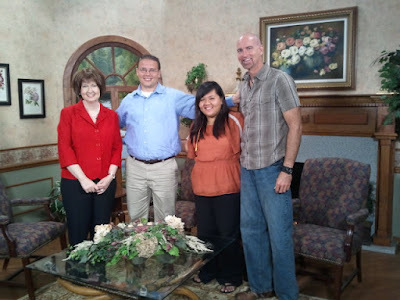 We had a great interview on CTN TV today highlighting Smileys Coffee House (& GTD)... fun times with Rob Beswetherick, Kim Huynh, Elissa Beswetherick (with moral support), & Doug Garner. Special thanks to Darlene, Susan, Preston & the whole CTN crew... u guys rock!! ...show airs Sept 21st. 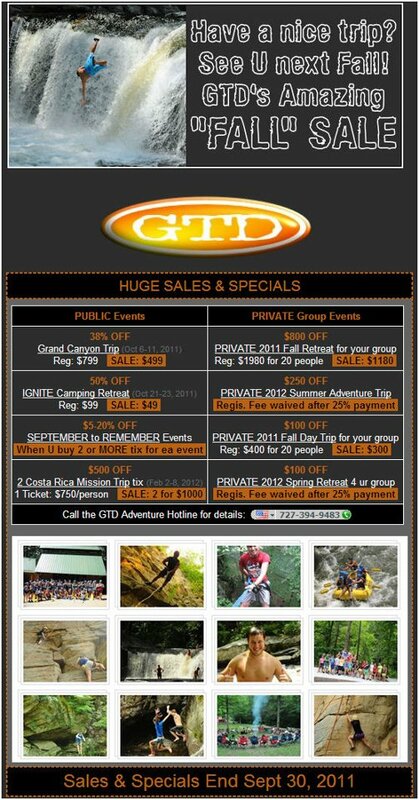 Check out GTD's new "FALL" Sales & Specials... save some major "dough" so you can go!! 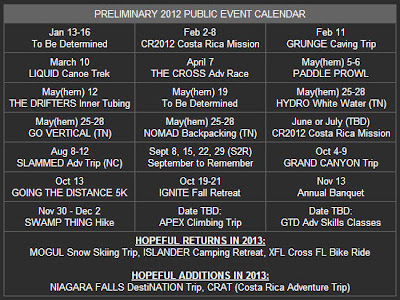 Here it is... GTD's preliminary 2012 Public Event Adventure Calendar... We are kicking off the year with a mission trip to Costa Rica Feb 2-8!! I'm very excited about the newest addition to our fall calendar: September to Remember (let's call it S2R for short). S2R is designed to be a "FUN"raiser as well as a God-awesome set of GTD events. Last month we had a blown transmission and other vehicle repairs that totaled over $4000. We are still recovering from the national economic downturn that hit us so hard in 2009. The fall is typically our slow season so I'm excited about the opportunities we have to use the open calendar to add more events that will get people into God's creation, into God's word, into deeper fellowship, into fun activites, and help us raise needed funds to pay off our short-term loan off for the repairs. It was a GREAT & full summer! I've been back in the office for a little over a week and working non-stop till 3am every night on revising our 2011 fall calendar, nailing down our 2012 calendar, preparing for our Annual Banquet, entering financial data from the summer, and working on several potential private events that may be lined up over the next 12 months. I look forward to sharing all the updates with all our GTD fans out there. All I can say is, "Put on your seatbelt, because it's going to be an intense fun ride!"